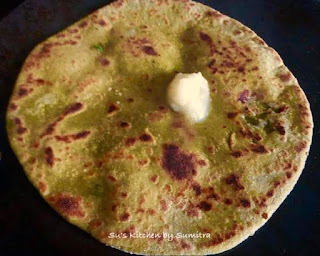 This paratha is good for children who refuses to eat green leafy vegetables. 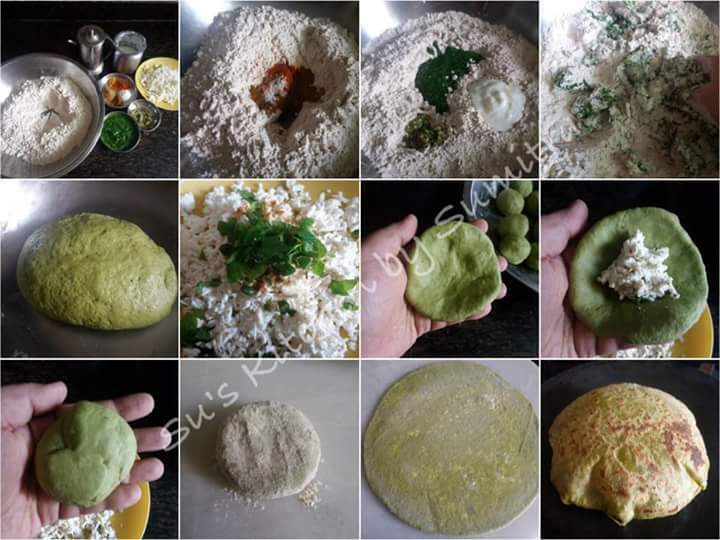 This can be eaten with curd and pickles. Take a mixing bowl. Add the flour, spices, salt and oil. Mix it well. Add curd and spinach purée. Mix it, add water as required and start kneading into a dough. Knead the dough for 5 minutes, cover and keep it aside for 15 minutes. Take the grated cottage cheese, add salt, cumin powder, chopped chillies and mint leaves. Mix it. Divide the dough into lemon size balls. Take a ball. Flatten it. Fill a tbsp of the stuffing. Seal the dough from the edges. Coat the dough with dry flour. Roll it. Heat a skillet up. Place the rolled dough on the skillet. Cook the paratha on both the sides for 2 minutes until bubbles appear. Apply ghee and fry the paratha... Serve it hot..